The sad reality of painting is that you will make mistakes, especially if you are just starting out. Things rarely go as planned. The drawing might look slightly awkward, the colors might not work together or you might have just made one too many strokes. 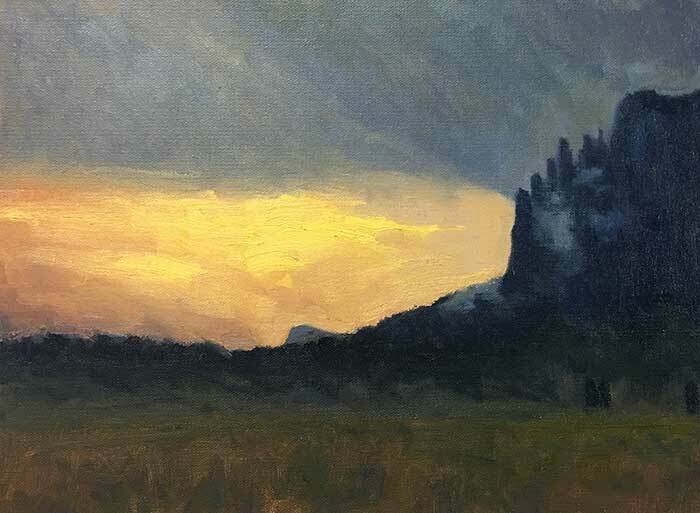 In this post I want to discuss how you can deal with making a mistake in your painting. But before I get into it, I will say that mistakes are certainly not limited to beginners. You will always make mistakes, no matter what your skill level is. However, the difference between a master artist and a beginner artist is that the master will be able to quickly and efficiently resolve mistakes. So try not to get frustrated by mistakes. They are just part of the game. 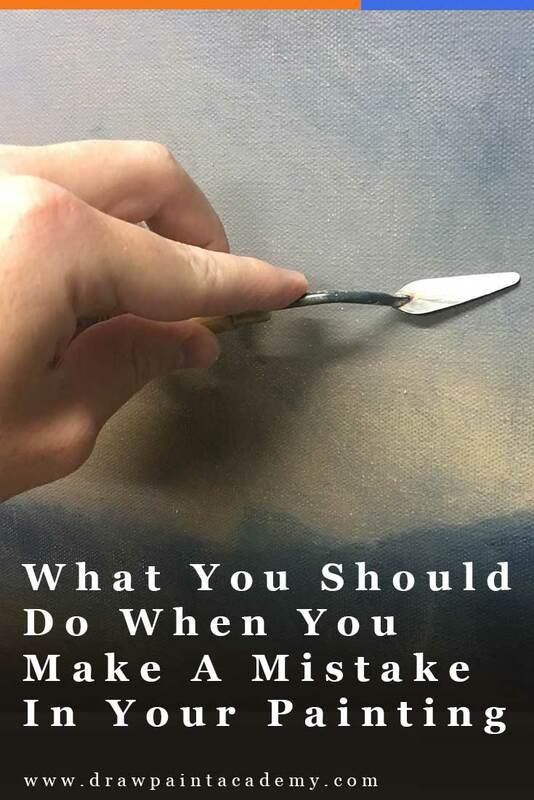 If you think you made a mistake in your painting, the first thing you should do is stop working and identify the problem. You do not want to try and guess your way to a solution. That would often just lead to an overworked mess on the canvas. If you can identify the problem, then you will have a much greater chance at resolving the problem. In painting, there are few mistakes which cannot be fixed if you identify them early. But you do not have unlimited attempts at fixing a problem. Eventually, your paint on the canvas will get overworked and will not be pleasant to work with. That is why it is important to work efficiently when you are trying to solve a problem in your painting. Trial and error is not a great approach. When you make a mistake, it is often not clear what the mistake actually is. You will notice that it just looks wrong, but you will not understand why. So, that is why you need to go into problem-solving mode when you think you have made a mistake. Your drawing is wrong. This is probably the most common mistake. Your values are wrong. 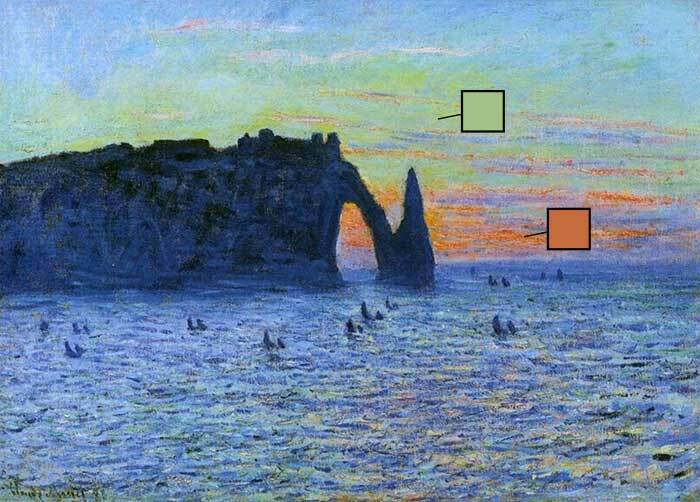 This can be a tricky problem to identify, as you might have the right hue but the color is too dark or light. Your edges are wrong. With edges, you have hard, soft and lost edges (I wrote about edges in this post). Edges provide a lot of information about a subject, but if you use the wrong edges, then that may look awkward and confusing. 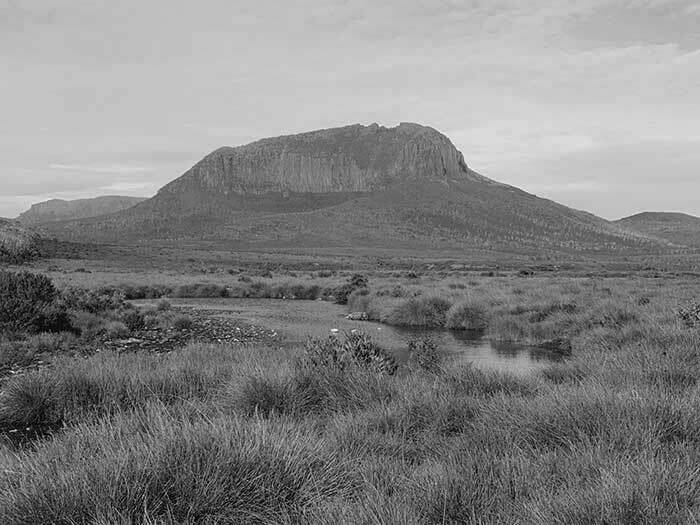 For example, a hard edge may look out of place when used for the horizon line in an overcast seascape painting. You have not painted in accordance with the light source. Your colors are wrong. Color (or more specifically, hue) is the last and least important on this list, as it does not actually provide that much information about a subject. But it is still a common area to make mistakes. More often than not your problem will sit in one of the areas above. If you can narrow your problem down to one of these areas, then you just need to continue narrowing down until you are very confident in what the issue is. Here are some practical tips for problem-solving. 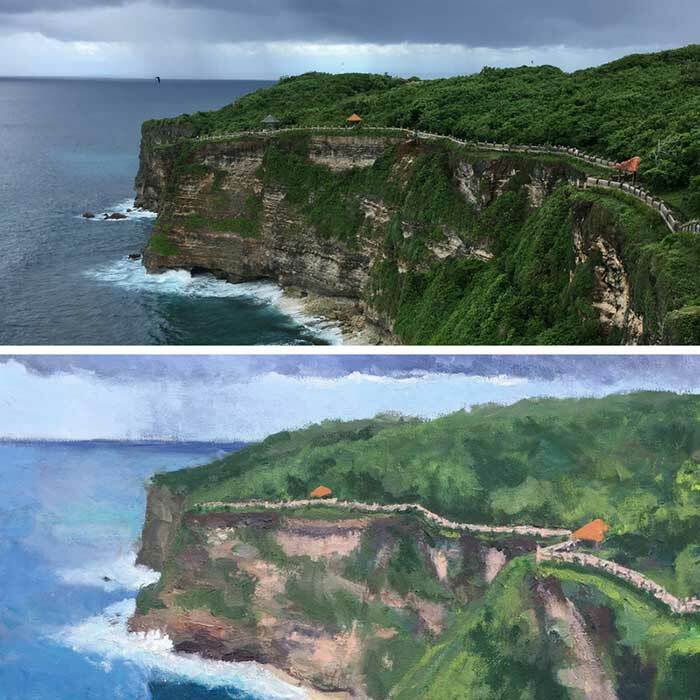 If you think there is an accuracy issue with your drawing, you can place a grid on a photo of your painting and the reference photo to identify any discrepancies and where those discrepancies occur. 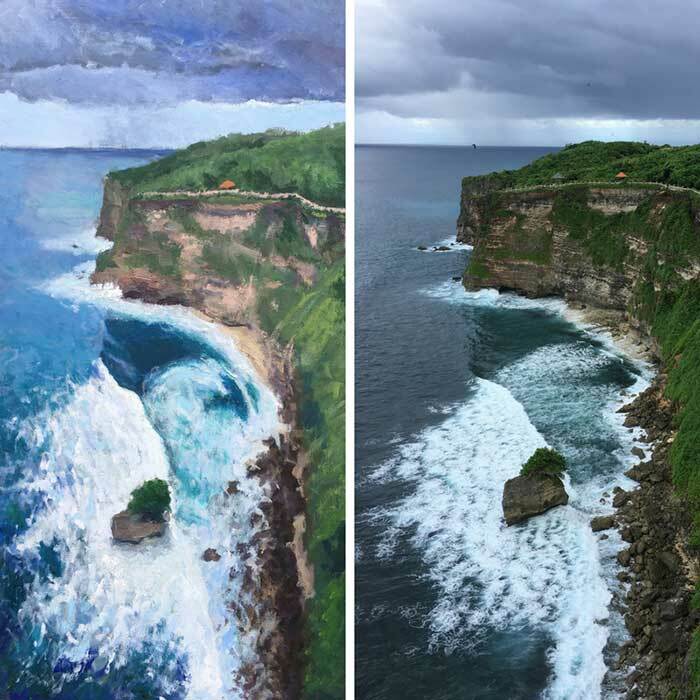 If I feel like something is off in my painting, I will sometimes take a photo of it and compare it side-by-side to the reference photo. You can use a website like Canva to do this. You can use a color checker in Photoshop or some other editing program to compare the colors in your painting and the colors of your reference photo. However, I would only do this if there is a serious concern about the colors. You do not want to start relying on editing software. "It can be difficult to see the forest through the trees." 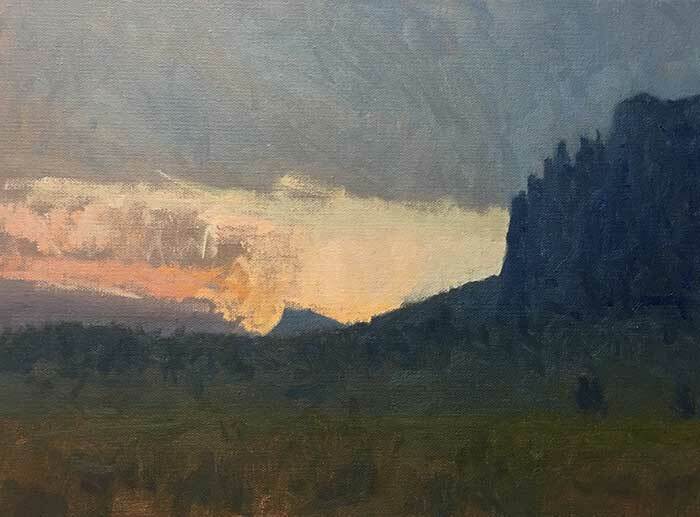 Thumbnail images are a great tool for seeing your painting without all the detail. 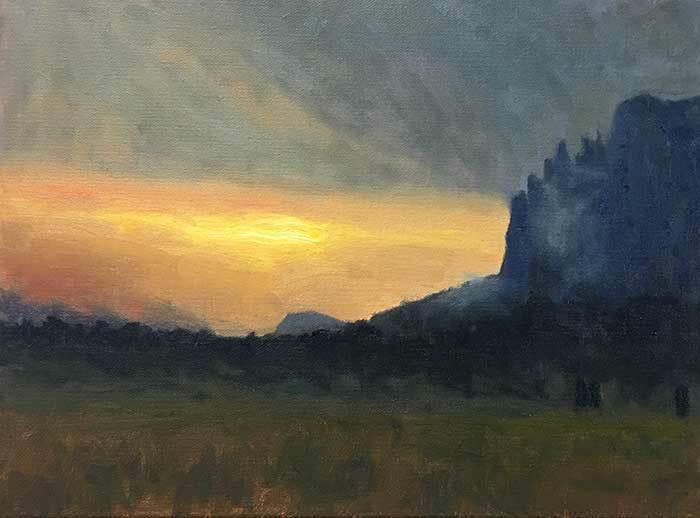 After I have finished a painting, I will often compare a thumbnail image of the painting to a thumbnail image of the reference to see if there are any glaring differences in composition and color. The thumbnail images reveal the "big picture" issues which I may not be able to see with the full-sized images. 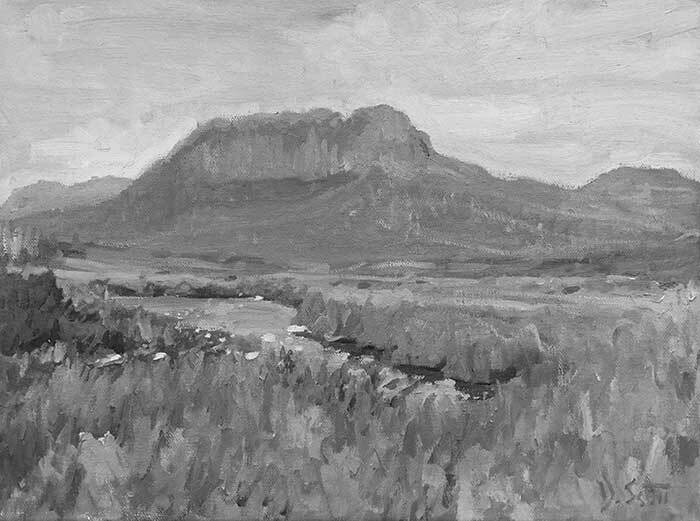 If you take a photo of your painting and convert it to grayscale, you can easily see if there are any glaring issues in terms of value. Once you have identified that a problem exists and what the problem is, then you need to determine if the problem can be fixed. Unfortunately, not all problems can be fixed. Some mistakes are so fundamental that it would be futile to try and work through them. These kinds of mistakes usually occur early and are not picked up until the later stages of a painting. What mistakes can be fixed? Mistakes which you have only recently made in the painting can usually be fixed pretty easily. Mistakes which involve minor aspects of the painting. In fact, these mistakes can often be left unchanged if they have little impact on the overall painting. Mistakes regarding colors and edges can be fixed easily if working alla prima. What mistakes cannot be fixed? Mistakes which occurred early in the painting process and involve a fundamental aspect of the painting. 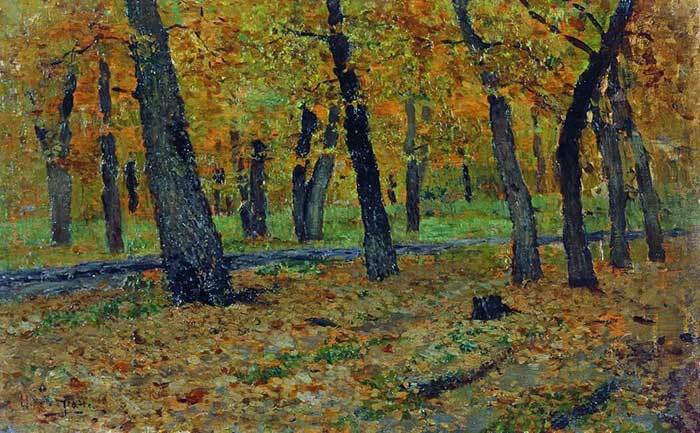 Mistakes which involve the overall composition and color harmony of the painting. These mistakes usually occur before you have even picked up your brush, during the planning and subject selection stage of your painting. If the mistake is fixable, you could start making adjustments until you are happy with what is on the canvas. However, you should be very careful before you place brush to canvas here. Have an actual plan for fixing the problem and think very hard before making each stroke. Remember, every stroke you make could either make your painting better or worse. If you are fixing a problem, then you do not want to keep digging a bigger hole for yourself. 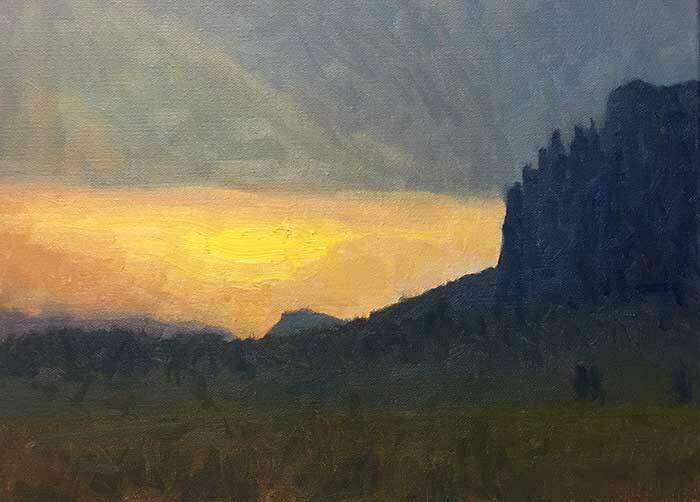 In my painting below, I was not happy with the sunset. At the time it was fixable, so I started making adjustments (but sadly this painting did not work out, as you will see at the end of this post). If the mistake is more significant, it may be more efficient to just use your palette knife to scrape away the paint from the affected area. This option can save you much frustration in trying to work through the problem. Just be careful that you only scrape away the affected area and that areas which are fine are left untouched. Also, you do not need to get rid of all the paint from the canvas. 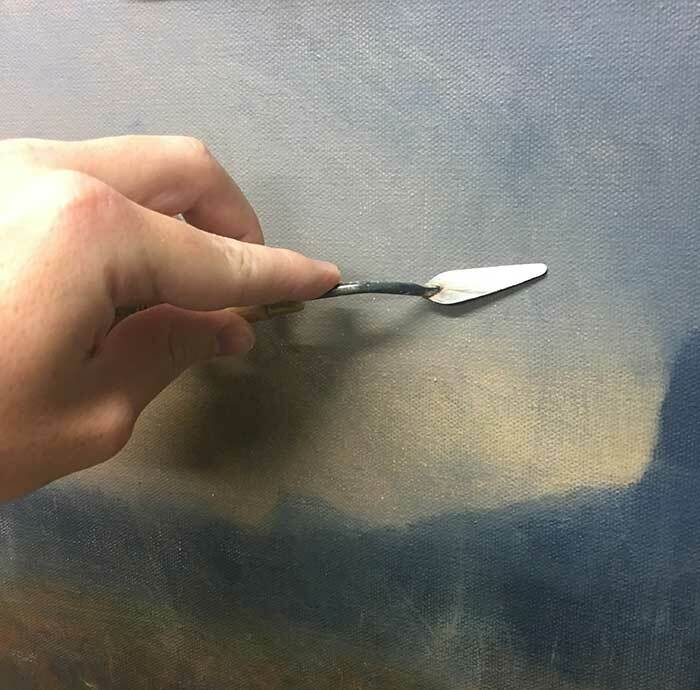 You just need to scape away enough paint so that the canvas is once again responsive (the more paint you have on the canvas, the harder it is to work with). The last and most drastic option is to just cut your losses, wipe the canvas down and start again. Sometimes, the mistake can be so significant that it would just be futile to keep working through it. I will resort to this option when I just do like where my painting is at and I see no possible way of turning it around. But before I wipe the canvas down, I usually make a few last-ditch efforts to get the painting back on track. There is nothing to lose at this stage so I can take risks I usually would not take. If those efforts do not work out, then I just call it there and start again. If the painting cannot be fixed, just take a palette knife and scrape away the bulk of the paint. Then you can take a rag plus some solvent and wipe it down further (if you are using oils). 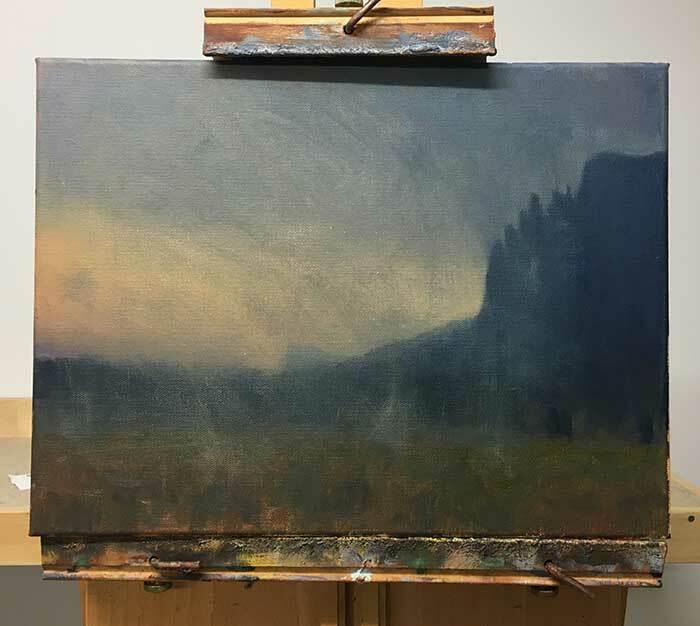 If you are planning to work on the same composition, then you might want to keep some kind of remnants of the painting on the canvas to assist with your second attempt. Below is a painting that just did not work out for me. I may have actually pulled the plug on this one a bit early, but sometimes it feels good to just scrap it and start again. I actually took a risk with this painting by continuing to work on it when I could have just left it where it was. I would much rather take a risk and screw some paintings up, than only ever take the safe approach. The safe approach would have me never improving. Thank you so much for your honesty and generosity-really good to know. I’m so happy I read this article. I’ve been trying to adjust a painting but now realize I’m going to need to scrape it down. Although acrylic there is too much paint to work over it. My error was in the size of the object. (A canoe) . So guess I’ll go back and start fresh. Thankyou for all the great pointers Dan. Really glad to hear Jean! Sometimes it is just so much easier to scrape an area down and start again. Thanks for this!! I have done the wipe down thing several times!!! Sure appreciate your blog and instruction. I really have difficulty determining whether the painting is finished or not. I usually set it aside for weeks on end and give myself time to observe, correct or appreciate the results. Oils allows time to correct errors. I also just can’t lean toward brush work. Have even gessoed canvas like brush work and used marble gesso what is your take on this method? I LOVE the painting at the end of your article!! But if you don’t like it, then as the painter you are allowed to trash away. I’m new to your posts and am throughly enjoying them and learning a lot.